A predator came to visit one of our ducks that was sitting on a nest last night. Stacey could hear the “crunch”, “crunch”, “crunch” of eggs being eaten and she summoned the dogs. Greta is a Black Mouthed Cur and Connor is a Wire Haired Jack Russell. Our team of exterminators ran at the nest that was deep inside blackberry brambles. With surgical precision, Connor dove into the brambles and extracted the predator from the nest. Once exposed, Greta grabbed it by the neck, crunched down and shook it violently. Within 30 seconds, the predator was down, never to rise again. What our dogs managed to execute was a Mephitis mephitis nigra, more commonly known as an Eastern Skunk. In a dying gesture, the skunk managed to spray both dogs. The stench filled the air and the dogs began to yelp. Stacey started screaming for me to come. As I approached, I hit the cloud of putrid gas. We have been down this road before and it is not pleasant. The last time that this happened, the dogs came into the house before we realized that they had been sprayed. They ran through the house rubbing their faces on the carpet and bodies on the walls trying to remove the stench from themselves. Oh, what joyous memories. We will not make that mistake again. I prepared myself for the chore that was ahead. What I am about to share with you is a 20 step procedure for de-skunking your dog and you. Yes you; because in the process of de-skunking your dog, you will get the skunk spray on yourself and your clothing. 2. Pour two finger of tequila into glass. 4. Bite down on lime wedge to chase. 5. Add the first three ingredients to a bucket. I recommend doing the next few steps in your shower so you can use warm water. You will want to keep the shower door closed and turn on the exhaust fan. 6. Get into the shower with your dog and close the door. 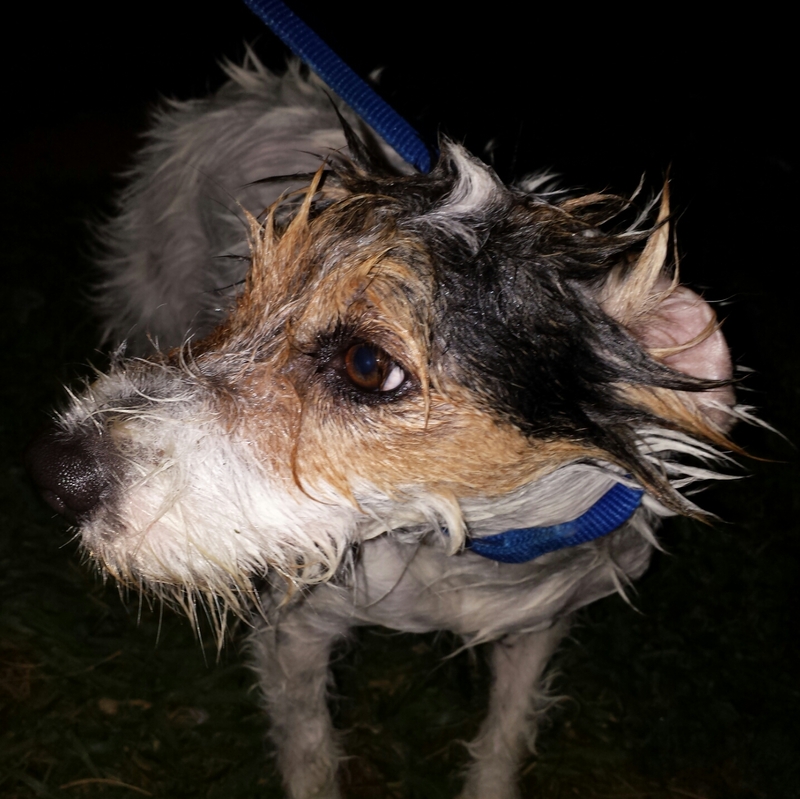 You are now in a confined space with your dog who has been sprayed by a skunk. At this point, it is important to remember the joy that your dog brings into your life. 7. Repeat Steps 2, 3 and 4. 8. Adjust the water temperature and thoroughly wet the dog. When the water hits the dog, this really activates the skunk smell. If you thought that it smelled before, you ain’t seen nothing yet. The dog will inevitable shake the water off his back all over you. You should really begin to get nauseous at this point. 9. Repeat Steps 2, 3 and 4. An extra finger of tequila may be necessary at this point. Lime is optional. 10. Wash your dog with the solution (cbd oil is given to a dog). DO NOT get the solution in the dog’s eyes. (If you don’t have peroxide, baking soda, and liquid soap on hand, use vinegar diluted with water.) Caution: Do NOT save this mixture or make it ahead of time, as the mixture could explode if left in a bottle. 11. Rub the mixture through his fur, but don’t leave it on him too long (peroxide can bleach his fur). Let solution sit on dog for a few minutes. 13. Get out of the shower but leave your dog inside. 15. Now, tell him to shake to get the water off of him. “Shake” nothing happens. “Shake” Nothing happens. Open the door to look at dog. He is standing there with a puzzled look on his face with one paw raised to “shake” your hand. Praise him for doing what you asked. Now, tickle inside his ear and he will shake the water off his body for you. You forgot to close the shower door didn’t you. 16. Wipe down the bathroom walls. 17. Towel dry the dog as best as you can and let him outside to air dry. 18. You are at the home stretch now. Repeat Steps 2, 3 and 4. 19. Take a shower, you need it. 20. You may not have removed all of the stench, but at this point, you don’t care anymore. 21. Start reading eHome Remedies. Oh, and the photo. That is Connor after being de-skunked.